DeLonghi EC155 and its brother EC220 are very similar to each other. Not only the design, but also the price and features they have come with, which sparks people’s curiosity what exactly set them apart from each other except the build. If you plan on purchasing one of them, you may want to read our article first just to make sure you are going to pick the best one. 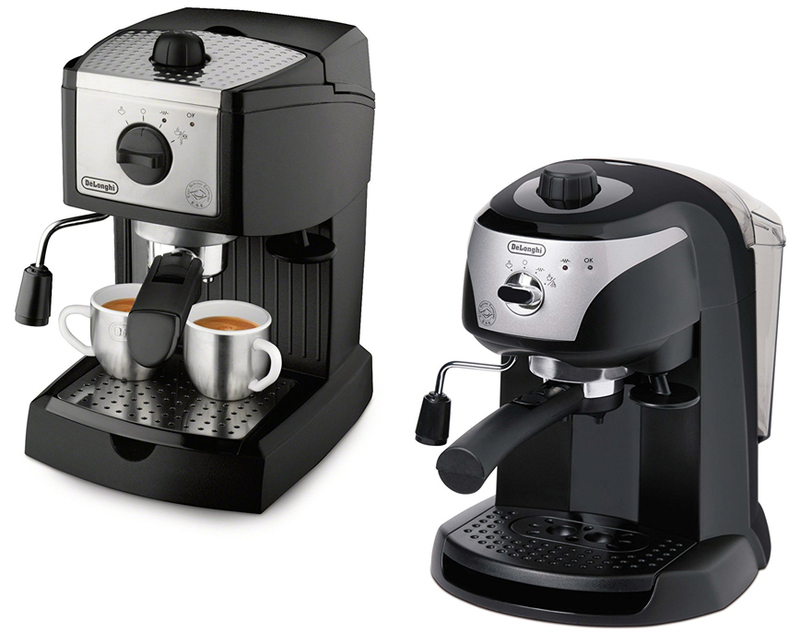 DeLonghi EC155 is an espresso machine from the famous coffee machine maker DeLonghi. This company is well known among coffee drinkers for their quality espresso machines that not only able to produce great coffee but also last pretty long. 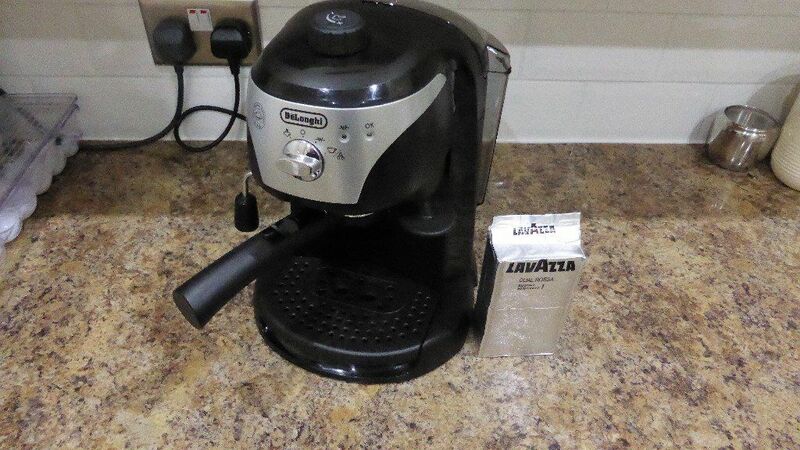 This machine is very easy to use, moreover, it is affordable and perfect for those who wish to own an espresso machine but have less to spend or reluctant to spend so much on more expensive espresso machines. DeLonghi EC155 will ease your morning coffee routine or late night caffeine craving when you have to stay awake longer. It is also ideal for people who want to switch from their usual instant coffee to a much stronger brew. DeLonghi EC155 is driven by pump and featured with frothing wand to swift your bitter dark espresso into creamy beverages. From the outside, DeLonghi EC155 looks like a small pod-style coffee makers, measuring at 10.5 inches tall and 8.25 inches deep, the machine is pretty compact and will not consume much space. Weighing no more than 7 pounds and 2 ounces, you can easily transfer it around your house. The body is constructed mostly with plastic material in black and control knob located at the front of the unit for convenient operation. As it have been mentioned earlier, this machine comes with a steaming wand to froth your milk, so you can enjoy any beverages that required coffee and steam milk to make anytime you want. DeLonghi EC155 have dual thermostats to handle the temperature for both water to brew your coffee and steam separately. This is important, since the ideal water temperature to brew your coffee should be higher than the temperature needed to froth your milk. Frothing your milk with the frother will get you rich delicious milk for your espresso. DeLonghi EC155 is able to do either single or double espresso shots with its 3 in 1 filter holder. If you only want to prepare single shot, it is recommended to use 7 grams of coffee ground and 12 grams for double shots or use a serve pods for busy morning. The machine will prim itself, so you are ready to brew anytime. With its double wall filters, you will get high quality crema in every brew. DeLonghi EC155 water tank is conveniently placed in the machine; it can be removed and refill easily because of its square shape and built in handle as well as flat bottom. This water tank can take up to 35 ounce water or around 1 liter water, so you won’t have to fill it every day for daily single user, but if you often make double then you will have to fill it at least every two or three days. The drip tray is removable to ease you cleaning it if needed; you can clean it using hand as usual. The brewing indicator at the front of the unit will let you know about the brewing status. DeLonghi EC220 is a manual espresso machine from the same name company. 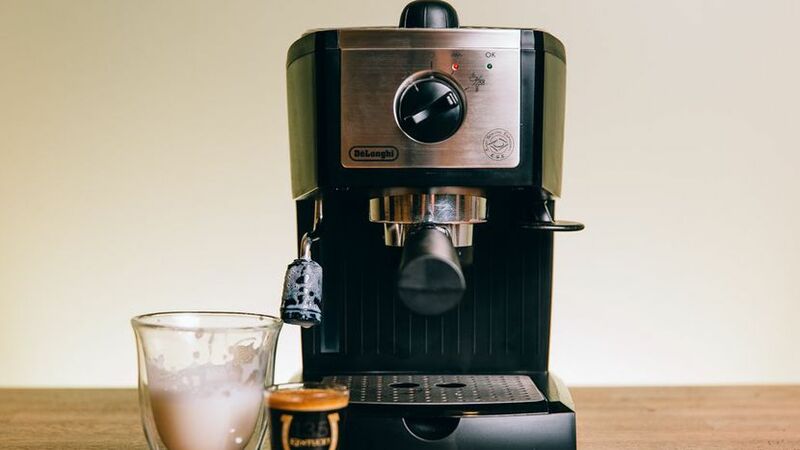 This espresso machine is able to produce rich espresso, completed with steam wand to froth your milk and turn your bitter strong espresso into creamy beverage in no time. Coming from DeLonghi, you can expect nothing less than great coffee result and durability of their products. Coming in such an affordable price, you will get amazing espresso in each brew. See here for another DeLonghi machines. Owning DeLonghi EC220 will also saves you more money since you don’t have to spend so much again in coffee from coffee shops. You can make your favorite beverages in your own home anytime you want. Whether it is to energize your morning or to help you stay awake at night when work is piling up. You can use your favorite blend to make your espresso or ESE coffee pods with the machine. From the outside, you can notice that DeLonghi EC220 look a bit round with most of the body is constructed from plastic material in black color and silver around the control knob at the front of the unit for convenient operation. Measuring at 9.45” in length, 10.6” in width, and 12.0”in height, it is practically small for any kitchen top. Weighing around 2 pounds, you can easily carry the unit around your house. DeLonghi EC220 comes with a crema filter holder to allow you use either coffee grounds or ESE pods. So when you are in a hurry you can just put the pod inside without having to measure your coffee ground and save some time. With its built in frothing wand, you can froth your milk into a creamy and smooth liquid to change your espresso into milder drink. You may use it to make a wide range of coffee and milk base drink like cappuccino or latte. DeLonghi EC220 is user friendly, you will get the hang of this machine after the first try, but make sure to read the instruction first to minimize the error. The water tank is placed at the back of the machine and it is transparent, so you can see it when the water is running out. You can operate the machine by turning the knob in front of the machine with symbol, so you will know the control for each specific features. Now let’s compare DeLonghi EC155 with DeLonghi EC220. From the outside, both machine already look different, EC220 is curvier while EC155 is more into square shape. From the inside EC155 have double thermostats to maintain water and steam wand temperature separately, while EC220 is not. So you can expect that EC155 will able to make better espresso and froth milk than its rival. - Kindly review the video under the image section for set up related and cleaning instructions of Espresso Maker. All in all, the decision is all yours to make. In our opinion DeLonghi EC155 is better than EC220 for the reason it have double thermostat. Moreover, the item is slightly more affordable than its brother.